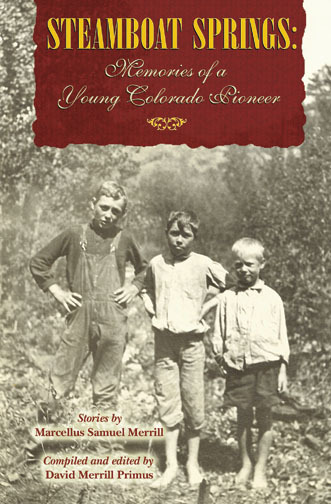 Although Marcellus "Celly Merrill was only four years old when he arrived in Steamboat Springs in 1905, his first impressions and the collection of memories tht grace the pages of Steamboat Springs: Memories of a Young Colorado Pioneer preserve the colorful, down-home history of this popular Colorado town that has since between a world-class ski area. In this captivating autobiography, David Merrill Primus, Celly's grandson, has gleaned through volumes of Marcellus' writing and chosen the best of his grandfather's stories to provide readers a true picture of early Steamboat and its surrounding area. The book features the early 190s--an exciting time when stagecoaches and snowshoeing gave way to horseless carriages and high-tech skiing in the blink of an eye. Honoring his grandfather and the past, Primus has edited, organized, and corrected the stories featured in this book for clarity and accuracy only, allowing readers to "hear" Celly tell his tales using the colloquial English of the day and infusing the frontier flavor of the time. Also, the inclusion of never-before-published historical photographs, sketches and mas greatly enhances this enjoyable journey into Steamboat's yesteryear.